I don’t know about you, but the Jubilee has brought out the joyfully tasteless in me. Edible gold sprinkles and cupcake wrappers? Yes please! Union jack cake with matching union jack napkins? I think so! 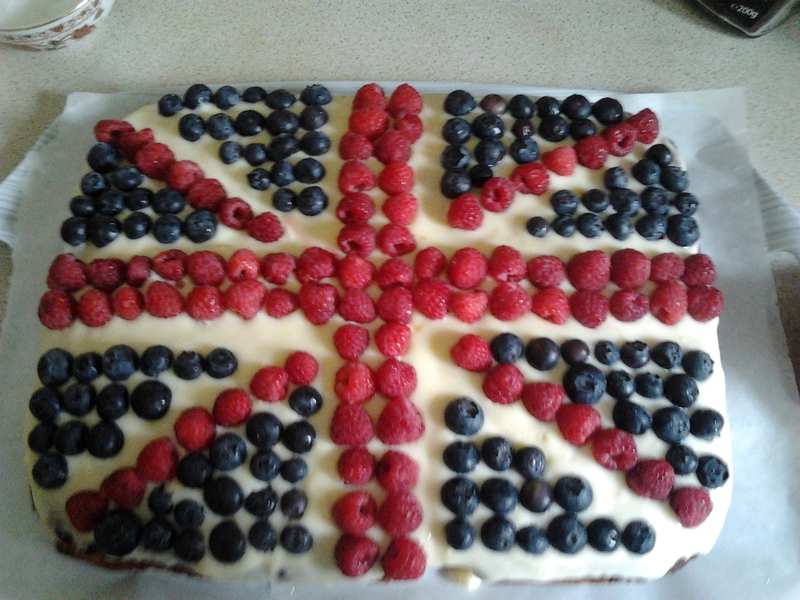 The first cake I made is a Union Jack blueberry sponge. The recipe is basically Bill Granger’s which I found on the website foodthatserves, so I won’t reproduce it here. I wrapped the finished cake and froze it. I made the cream cheese frosting the day before and put it in the fridge. Then on the day, the cake defrosted then I iced it and decorated with fresh blueberries and raspberries. I didn’t have a board or plate big enough, so I put in on a tray covered with some baking parchment. 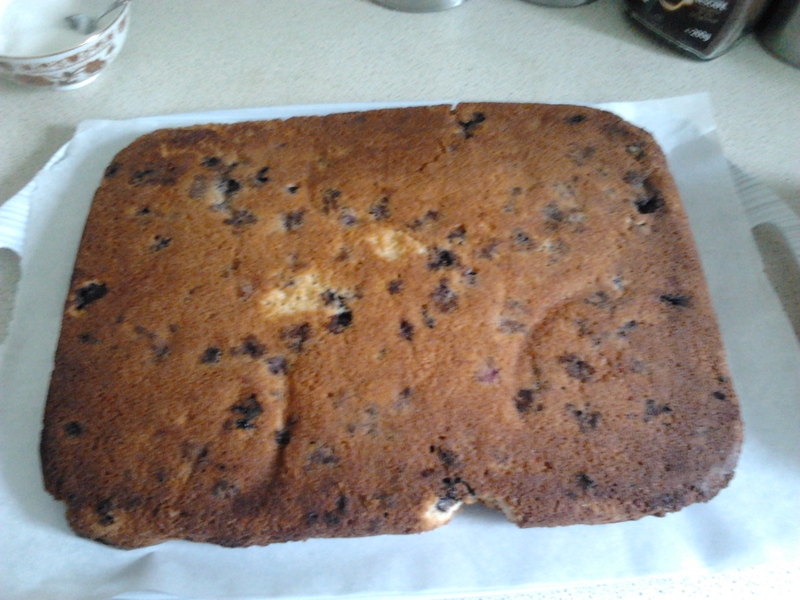 It needed about 250g raspberries and 150g blueberries for the topping. This is a great cake for church/ a party, and it was very popular at our event. Because it’s rectangular, it’s easy to cut. 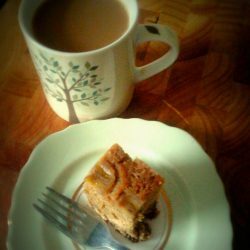 Without the fresh fruit, it would be ideal with a cup of tea! I also made Jubilee Crown Cupcakes. These were taken from the goodtoknow website, which had loads of Royal baking ideas. I made a double batch (24) of the cupcakes a day in advance. Plain or metallic cases would be best, so as not to distract from the crown peaks. 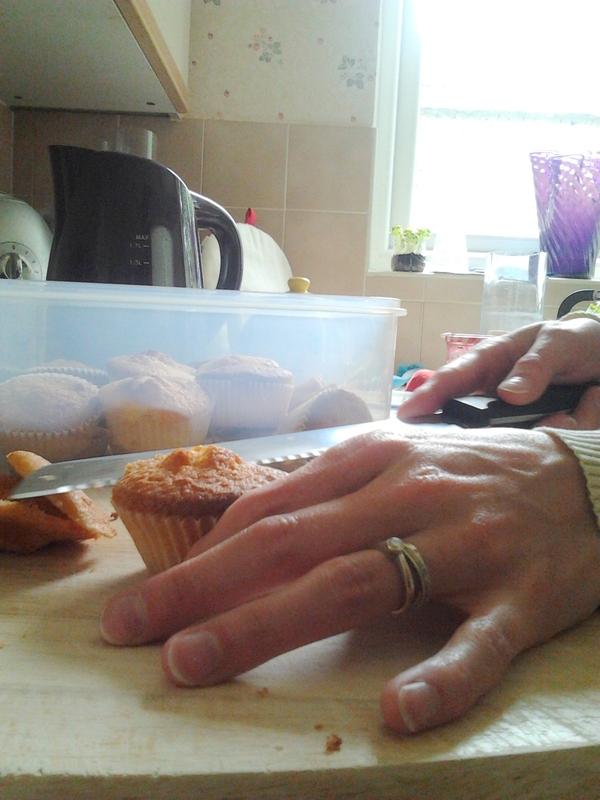 The cakes needed the tops levelling off – I plan to use up the cut-offs in some fridge cake. 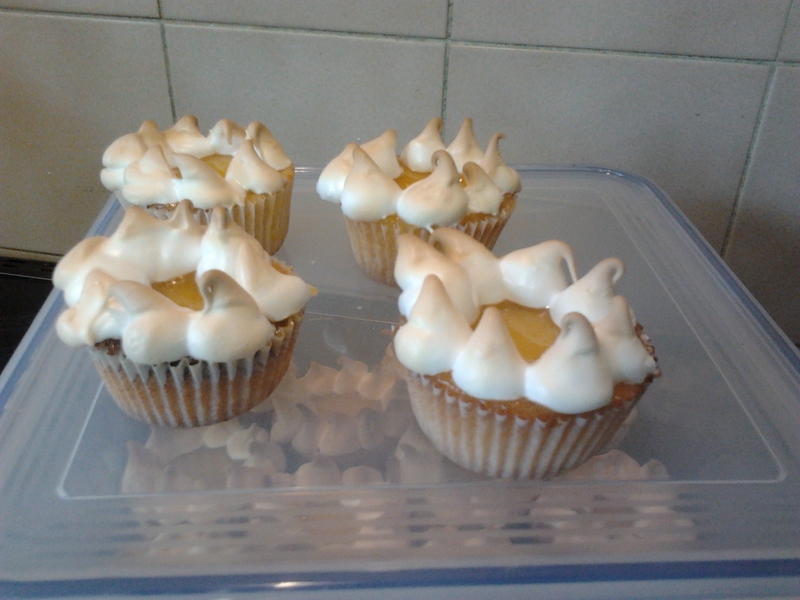 You then spoon about a tsp lemon curd on each one and pipe meringue into peaks to form a crown. I got the hang of this pretty quickly, so by the 24th I was whizzing round! Then back in the oven for about 10 minutes to go golden and set. Voila! Meringue crowns. I had some left-over meringue which I made into a pavlova. 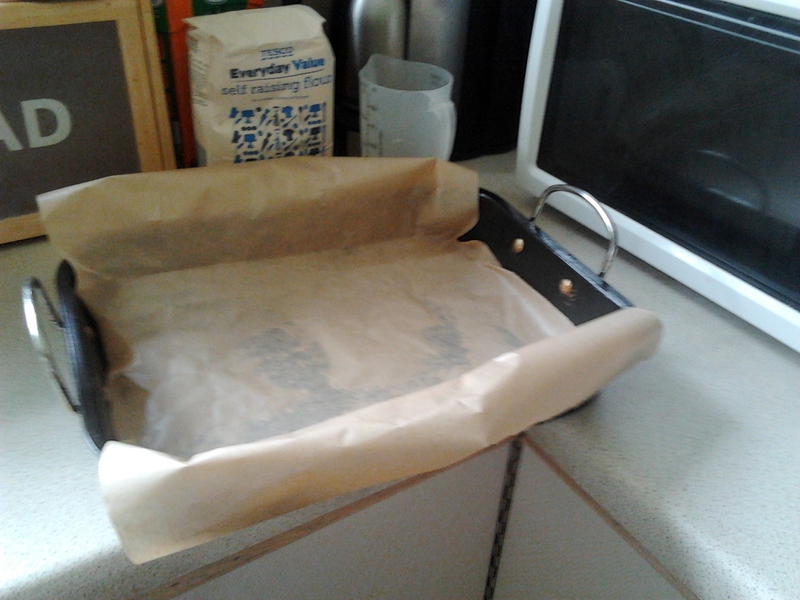 Just put some baking parchment on a baking tray. Spoon the meringue on in a circle – you could pipe some peaks around the egde if you’ve still got some left in your piping bag like I did. Cook in the oven until golden brown and set. Then turn off the oven with the meringue still in and leave overnight to cool. 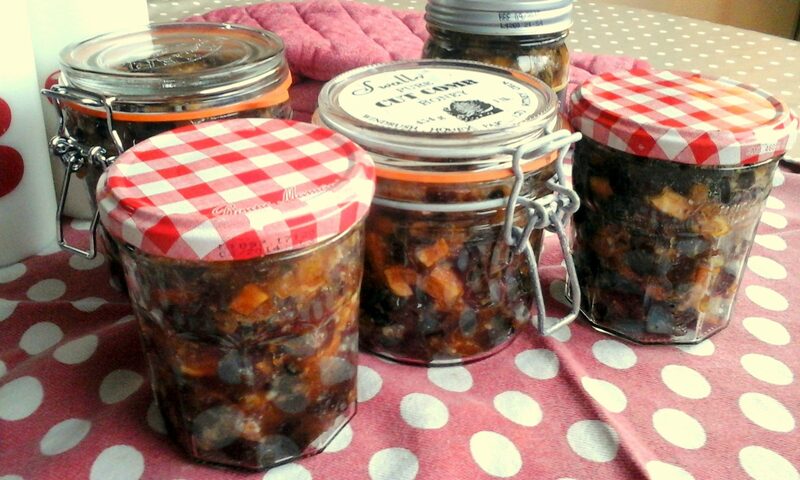 This makes it lovely and gooey inside! Serve piled with whipped cream and fresh fruit. 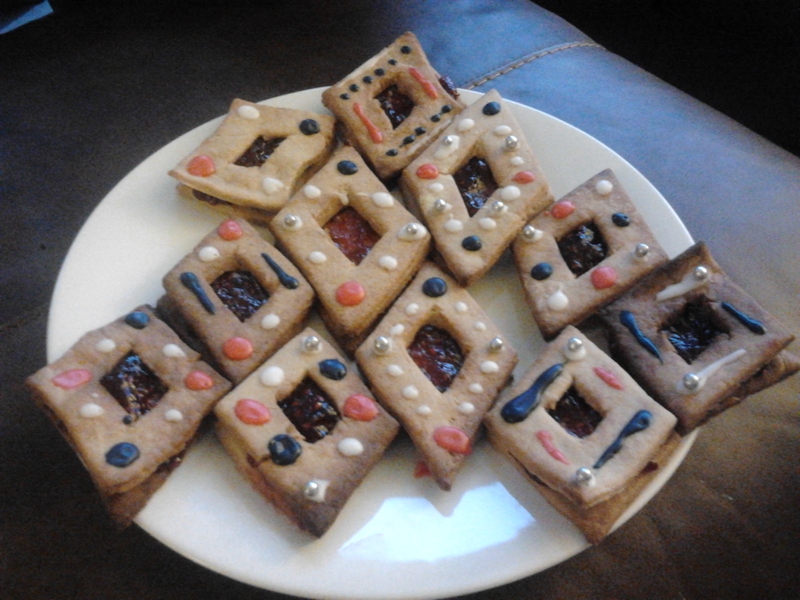 I had 4 egg yolks left over from the meringues so I made these jammy jubilee diamonds. Thanks! They were fun to make. And thanks for the recipe!